Everyone knows how to brush their teeth! We want to help you with this. This is a very simple educational process to enhance or improve on your daily Oral Hygiene procedures of brushing and flossing. If Bacterial Plaque is the causative factor or Periodontitis and Peri-Implantitis "should we not control the amount of bacteria that is present." Everybody has Bacterial Plaque and this is part of our normal oral flora that is with us 24 hours a day. 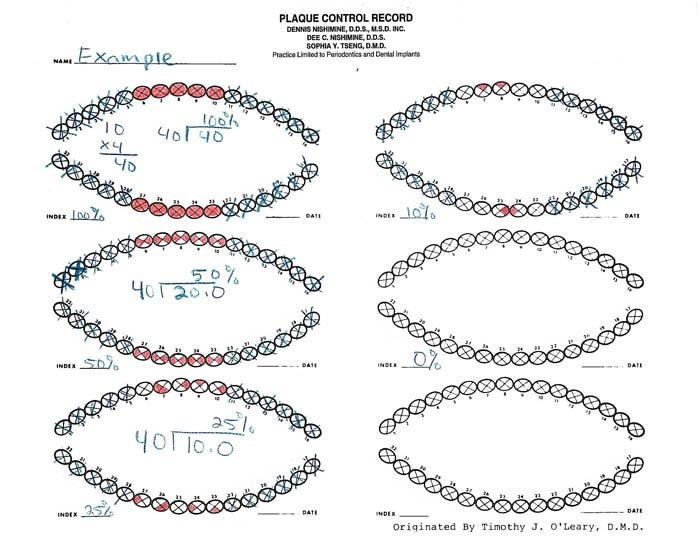 Timothy J. O'Leary, DMD developed the Plaque Control Record to be a simple teaching method to hep the patient see and realize the areas of the teeth that were being missed. "If we told you to brush your teeth for 6 hours a day and this was done ineffectively it would be of little value." We are trying to show you how to be effective and thorough in the removal of Bacterial Plaque. This is a simple method to show you how much bacteria is present and we will then be able to show you how to be more effective with the oral hygiene aides that we will be providing for you. We will stain or disclose the Bacterial Plaque and record the amount present. This is a simple percentage! If all the surfaces stain you have 100% and obviously a tremendous amount of Periodontal Disease (PD) present.